The Eachine Falcon 210 looks better on paper than it does in the air. 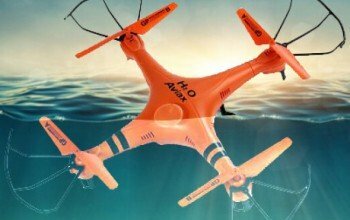 At first glance, it’s a small, brushless quad rotor with lots of features from a popular manufacturer. When I first heard about it, I was intrigued. I was looking forward to flying it, but what I ended up getting was a lesson in construction. This aircraft is aimed at serious pilots with lots of FPV experience, and it’s specifically designed for someone who likes to modify aircraft and tune things to get the best results. It’s designed particularly for someone who wants nothing but speed from the aircraft, and it’s also designed for people who want a few extra features, like OSD readouts. I’ve written about a lot of Eachine Falcons, some awesome and some already forgotten. The Falcon 250 was the first—it was big, bulky, and ugly, but it was a good introductory aircraft for people who were serious about racing. The Falcon 180 was my favorite. Even though it used tilted motor mounts, which I’m not a fan of, it still offered a good flight experience. The tilted motor mounts made coming to a stop very difficult because the aircraft would pitch up quickly when you let off the throttle. They did give you an extra boost of speed from the start however, and that really made for some interesting flying. This Falcon is about the size of a competition racer, and it’s got a few onscreen display features like artificial horizon and pitch readouts along with a decent camera. It has a bunch of lights and indicators, such as turn signals, brake lights, and speed lights. It also has switches to turn off the lights if you need to. It is pre-built, pre-bound, and ready to fly, and there are naze32, cc3d, and SPracing versions available. The 700 TVL camera has a good field of vision and gets a decent signal, although it’s certainly not the best. The tilted motor mounts can be easily removed, and I strongly suggest that you do that. This aircraft looks like a Falcon, and I don’t mean the bird but the aircraft. Every Eachine Falcon looks the same—apparently, Falcon means long-flying rectangle with rotor arms. This Eachine Falcon is built the same way as all the other Falcons, with the central box, or boxes in this case, made from carbon fiber plates screwed together with metal rods and lots of screws. I’m not a fan of this construction method, since it’s a real pain to take apart and put back together. The plates are hard to hold together while screwing everything in place, and the screws often strip. It’s not a horrible design, but it’s definitely not the best or easiest to maintain. As for durability, the frame itself is pretty durable, although I’m not as sure about the electronics, mainly just the motors and speed controllers. The aircraft comes preassembled with small two-bladed props that you can attach in a few minutes. It also comes with a set of four foam landing pads that stick underneath the rotor arms. The battery is the standard Eachine 1500 mAh 3 cell lipo with a balance charge plug. I personally used my quick charger, but you can use the included balance charger for a slower charge if that’s all you have available. You’ll need to provide your own VR glasses, but the package has everything else you need, other than batteries for the transmitter. You can reprogram the flight controller with clean flight and a USB cable, and you can quickly remove the tilted motor mounts and screw the motors on the frame for a better flight experience. The manual is the standard Eachine quick start guide with limited troubleshooting tips. My first flight with this aircraft was also my last flight with this aircraft, but I got a lot of experience during the few minutes I had with it. I tested everything out and made sure it worked, and I then strapped on my VR glasses and started flying. I immediately regretted flying it FPV. It was so fast and hard to control that I had to go up high and keep it in a holding pattern just to keep it under control. There was no way that I was going to be able to fly it between trees or through gates; it was just too fast and not responsive enough. I flew it around for a few minutes before I came closer to the ground. One of the main problems with tilted motor mounts is that they make you lose control when you slow down. They cause the aircraft to tilt up quickly when you pitch backwards to slow down. Another problem they cause is that they make level flight very difficult. When you’re going forward, the aircraft will either want to move down or up; it doesn’t want to fly straight ahead. This means that if you get close to the ground, say within 30 feet, the aircraft can quickly lose altitude and clip the ground; if you try to correct for it, you can easily cause instabilities. When I got within 30 feet of the ground going about half speed, I noticed the aircraft had a tendency to constantly want to dip down toward the ground, and I had to either pull up, making the aircraft faster and unstable, or try not to hit the ground. Eventually it hit the ground and went tumbling through the grass about 30 feet. During the tumble, the receiver wires were damaged without my noticing. I tried to test the aircraft to make sure it still worked, but it fell out of the sky and one of the motors stopped spinning. I took it home and spent about an hour taking it apart before I could get to the motor and speed controller. When I finally did, I spent the entire night soldering wires and components while trying to figure out if it was a bad motor or a bad speed controller. Eventually I got tired of working on it and just put it aside; the flight experience wasn’t really worth all the trouble. Sure, I could buy a new motor and a new speed controller and then spend a few hours soldering them in and trying to put the fiddly frame back together, but I’d still be left with an aircraft that doesn’t fly very well. I would still have to remove the tilted motor mounts and retune the PID settings. It was hours of work that didn’t really seem to have much of a payoff. Now, don’t get me wrong. I’m sure if you upgraded the settings, changed the props to three-bladed props instead of using tilted motor mounts, and tuned everything, you would have a nice-flying aircraft. If you’re into tinkering, you might like this one, and the OSD might be really nice; I just personally wouldn’t want to fly it in acro mode with the stock setup. I wasn’t as impressed with the included Eachine fsi6 transmitter as I was with my Flysky fsi6 transmitter. They are basically the same transmitter with different brandings, but the Eachine version doesn’t have PPM support, and the sticks didn’t center as well either. The readout in Cleanflight for the transmitter was a lot less precise than the Flysky transmitter was. They both offer a lot of features, but it just seems like the Eachine version cuts out and hides some of the features. I thought this aircraft was going to have GPS and a few other features, but the only OSD features mine had were altitude, horizon, run time, and voltage. It was all pretty easy to use, but it seems like everything on the sales page for this aircraft has been simplified compared to other Eachine aircraft. The 700 TVL camera wasn’t bad. It had a decent field of view, and it handled low light just fine. I did get a lot of interference on the day I tested it, but it might have been the result of a bad channel or some other factor. Eachine typically does a good job with their cameras. If I had saved up for a few weeks before buying this racer, I think I would be a bit disappointed. I know I would end up spending more time working on it than I would actually flying it. If you’re an experienced builder and programmer, then you’ll have no problem tuning this aircraft to make it fly great. I just think there are better racers out there.